This Fall, the GNG staff planted some individual pots of known wildflowers, but they also broadcast some wildflower seed mixtures whose composition was not exactly known by the staff. We knew what we would probably see in the Spring, but in the latter case, we might be in for some surprises. The latter case prevailed! Here are our discoveries, so far. Mountain Garland This is one form of the genus Clarkia that was featured in an earlier post (“Clarkia – A Native Flower with a History”, posted on May 4, 2014, archived in May, 2014). The flower has its petals arranged in a fan-like arrangement, rather than a cup-shape. 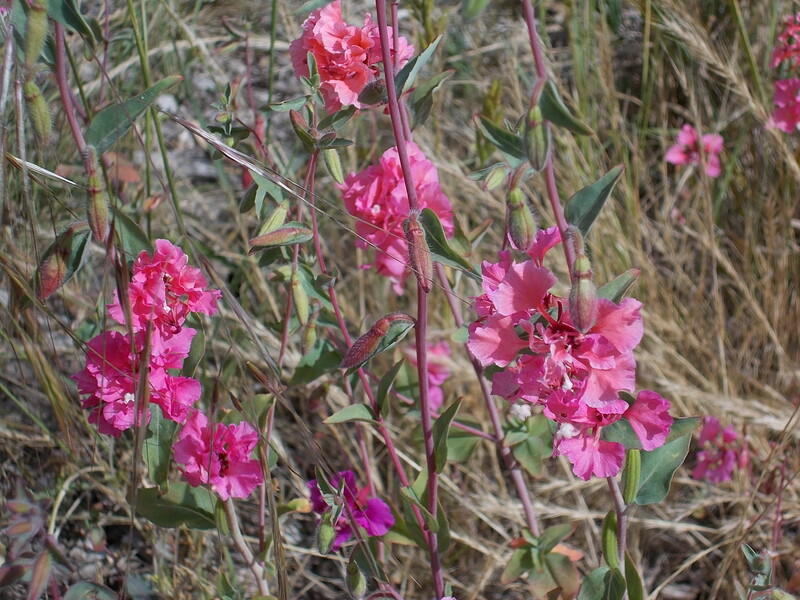 The Clarkias bloom later in Spring, but the mountain garland (Clarkia unguiculata) blooms earlier than the later-blooming “Farewell-To-Spring” (Clarkia amoena). bloom, and studied the ID markers that told them about the plants. Willi spent a lot of time admiring the bush poppy (see “The Ever-Blooming Bush Poppy”, published on February 3, 2015 and archived in February, 2015). 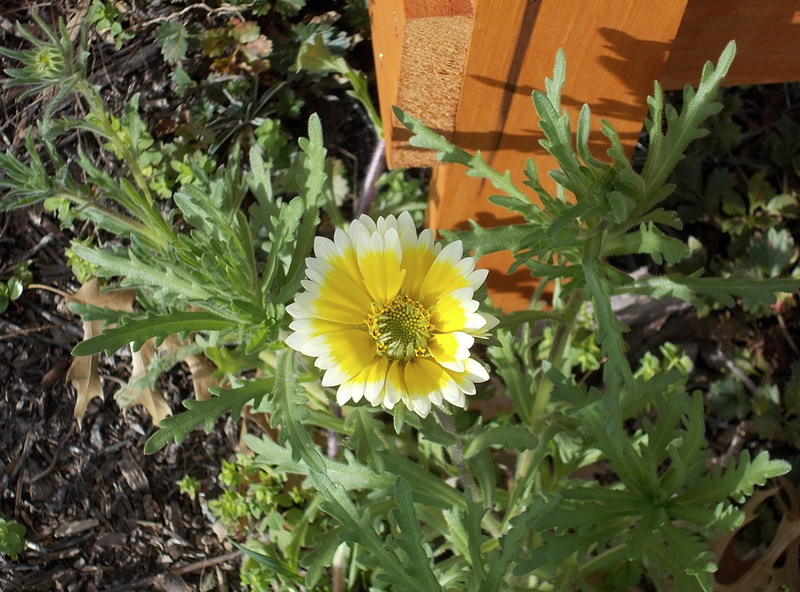 It’s bright yellow flowers prompted her to find one for her yard too. (Bush poppies are not readily available at all native nurseries, and might be a bit hard to get established, but they are surely worth the try.) 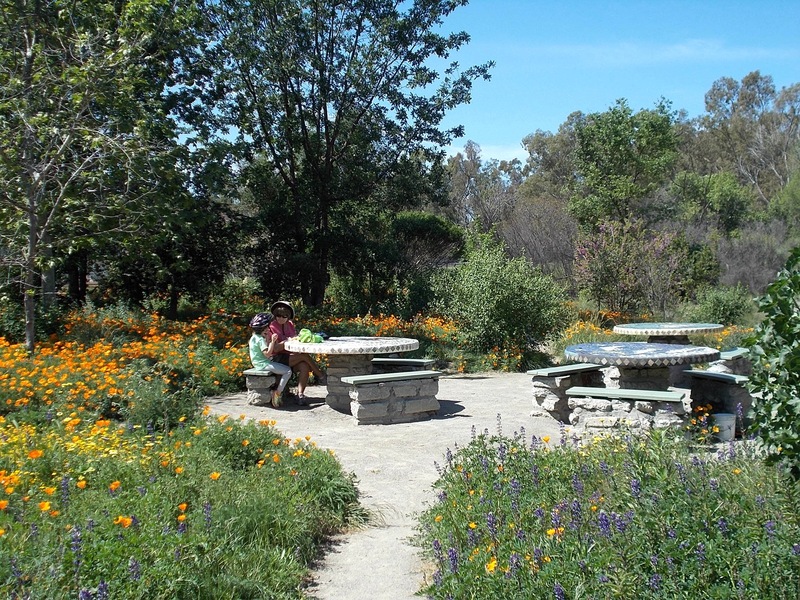 At this time in the Granada Native Garden, the early blooming wildflowers are be- ginning to shut down for the season. Soon they will mature and release their seeds for next year’s display, but are about to be replaced by the red, pink and white Clarkias (the mountain garland was first noticed in bloom on March 30; the farewell-to-spring should appear very soon), and the tidy tips seem to want to hang around well into Spring. Hopefully the evening primroses, and the one (currently) buckeye tree will be in bloom. We have seen monarch butterflies searching for the milkweed, buckeye butterflies and lots of bees visiting the holly-leafed cherry, and pairs of lesser goldfinches are breakfasting every morning on the ripening seeds of the fiddleneck. The flannelbushes are in full bloom now. There is always something going on there! Quote du Jour “As we passed below the hills the whole plain was covered with great patches of rose, yellow, scarlet, orange, and blue. The colors did not seem to mix to any great extent. 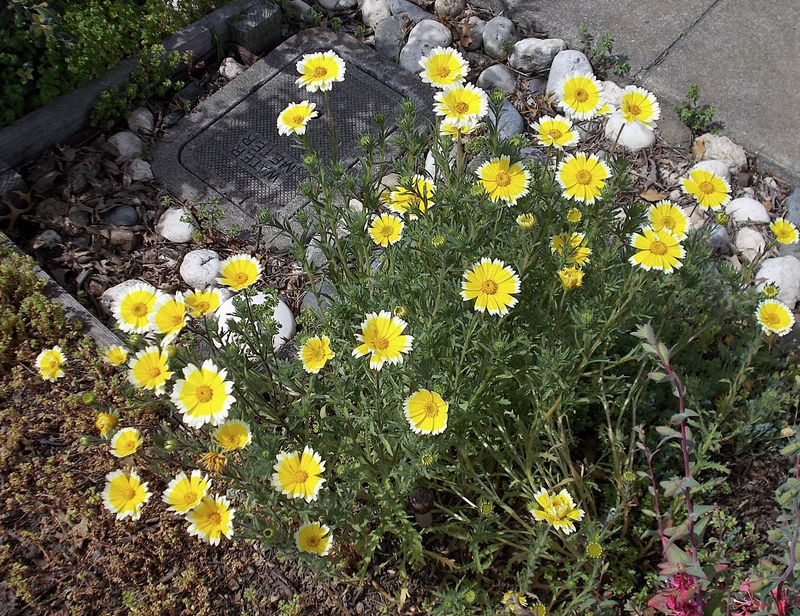 Each kind of flower liked a certain kind of soil best, and some of the patches of one color were a mile or more across. My daddy had traveled a great deal, and it was not easy to get him excited about wild flowers or pretty scenery. But he said that he would not have believed that such a place existed if he had not seen it himself.” – From the journal of Jeff Mayfield as his family first encountered the San Joaquin Valley in 1850; quoted from the website of the Larner Seed Company. This entry was posted in Uncategorized by jimlibjen. Bookmark the permalink.